Have you ever entered a greenhouse or nursery and seen a huge swarm of tiny black insects flying around? If so, they were probably fungus gnats. These annoying creatures are a common plant pest that can become an economic problem. To avoid losses it’s important that preventing and controlling fungus gnats’ numbers be taken seriously. 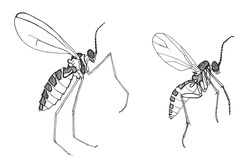 Fungus gnats belong to the fly family. Like most flies, fungus gnats are a nuisance. Even if there are only a few gnats, they can create a huge problem in just a short span of time. So you have to stay alert and take the necessary action to keep these pests under control. While some growers prefer to take preventative measures, others choose to take reactionary steps to control fungus gnat populations. Although both approaches can be effective, which one you use is determined by your supply budget, management style and available labour. Prevention costs can be somewhat prohibitive. However, if a severe infestation occurs, it can also be very costly to wait till action has to be taken. One of the simplest and safest ways of controlling fungus gnats is to place sticky yellow cards around the area where plants are growing. Attracted to the yellow color, the tiny adults that fly around get permanently stuck to the glue on the cards. Such cards are not only affordable, they’re effective and safe for both workers and the environment. Outside of a little residual glue, there is also no mess to be dealt with. Depending on the type of agricultural establishment, biological or chemical means may be chosen to control fungus gnats. One biological method is to use BTi bacteria (Bacillus thuringiensis israelensis) which produces a form of natural insecticide. Chemical means of control come in the form of either systemic insecticides like imidacloprid or pyrethroid type insecticides that include residual effectiveness like permethrin. Aside from choosing the best method of fungus gnat control for your greenhouse or other growing operation, it’s also critical that proper hygiene and sanitation is implemented in the process. A significant degree of prevention and treatment is achieved through cleanliness of the plant growing area as it decreases the risk of infestations from fungus gnats and other such pests. If you’re not sure which control or prevention measures should be use, it’s strongly advised that you consult a green house pest specialist to diagnose the situation and give you an appropriate recommendation. Controlling fungus gnats isn’t difficult, however, keeping all growing areas clean and sterile is the number one way to abate and control most pest problems.